As I have only recently been acquainted with all of the major works from Studio Ghibli - undertaking a month-long marathon a few months back and catching up on some of Miyazaki's masterpieces including My Neighbor Totoro and Laputa Castle in the Sky - it was quite exciting to have the opportunity to view my first Ghibli film within the environment of a cinema. What a treat it was. 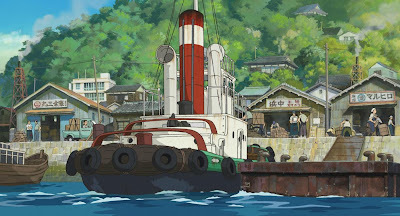 Though From Up On Poppy Hill is directed by Hayao's son, Goro (just his second work as director following 2006's Tales From Earthsea), it is co-scripted by his father and Keiko Niwa and based on a serialised Japanese comic book of the same name illustrated by Chizuru Takahashi and written by Tetsuro Sayama. 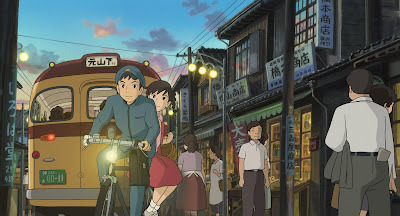 Released in Japan in July last year From Up On Poppy Hill became the highest-grossing Japanese film of 2011, but doesn't have a scheduled release in the United States until March 2013. From Up On Poppy Hill is set in Yokohama in the year before the 1964 Tokyo Summer Olympics and tells the story of Umi, a 16-year-old high school girl who lives with her her grandmother and sisters in Kokuriko Manor, a tenant house overlooking the harbour. Umi's father was a sailor lost at sea during the Korean War, and her mother is also absent from her life, studying in the United States. Every morning Umi raises signal flags in her garden with the message "I pray for safe voyages" as a way to remember and honour her father, before starting her rigid daily routine of entrusted responsibility around the house. Her school day is sandwiched between cooking and other chores. Umi's raising of the flags becomes a source of interest, and one day she spots a poem about her published in the school newspaper. Umi first meets Shun, a dashing and reckless senior who runs the newspaper, when he is participating in a daredevil stunt. They have several more chance meetings and Umi soon becomes attracted to the bustling optimism and energy of the Quartier Latin, a dilapidated clubhouse where the intellectually minded students (the Culture Club) have set up various headquarters for the school's clubs and societies. With Shun requiring assistance with his printing of the newspaper, he enlists Umi's assistance, and Umi begins to suspect that it was Shun who wrote the poem. At Umi's suggestion, many volunteer students begin to work hard trying to restore the Quartier Latin to its former glory. Working closely together, Umi and Shun begin to develop feelings for one another, but these feelings have to be reconsidered following some unforeseen revelations about their families' past. The students are also devastated to learn that their efforts to clean up the Quartier Latin have been in vain when a prominent Tokyo businessman and sponsor of the school, Tokumura, intends to tear down the building to make way for Olympic redevelopment. Umi, Shun and another member of the Culture Club, Shiro, are nominated to travel to Tokyo in a desperate attempt to persuade Tokumura to change his mind. 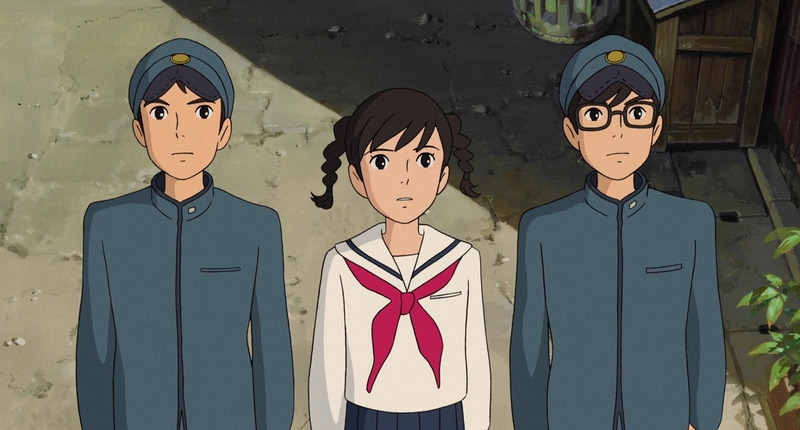 From Up On Poppy Hill is beautiful story with a charming teenage romance at the core, and much like some of the most poignant of Ghibli's features, offers up inoffensive small-scale drama and genuine stakes without the presence of an obvious villain. It relies on generating context and attentive world building, and after introducing us to characters we grow to care about, it becomes an immersive cinematic experience that successfully leaves a viewer in a state of pure joy. It is touching, funny, emotionally rich and thematically engaging. There were a handful of moments - whether they are conversations, surprising plot developments, or simply a reaction from a character - that brought swelling emotions of both sadness and joy. The conclusion is very moving, and it would take a tough person not to feel tears coming. Choosing to set the story in a real-world setting with a backdrop of a post-war period and significant industrial change also provokes interest. As the country struggles to pick itself up from the devastation of the Second World War, the new generation struggles to move towards a prosperous future whilst trying not to lose the essence of their past. For Umi her present will always be tied to her father and her past, but it is revealed that both her and Shun's fates depend both on their past, and a mutual embrace by Tokumura of the students' respect for the past and optimism for the future. In the end, several fates hang in the balance. I supported the characters every step of the way. I understood and embraced the feelings Umi and Shun felt for one another - and these form in a beautifully understated way - and desired nothing more than them to end up together. In much the same way I admired the student's passion for their clubhouse. With the exception of the opening sequences, which were a tad slow, Miyazaki junior has hit the right notes on every occasion. 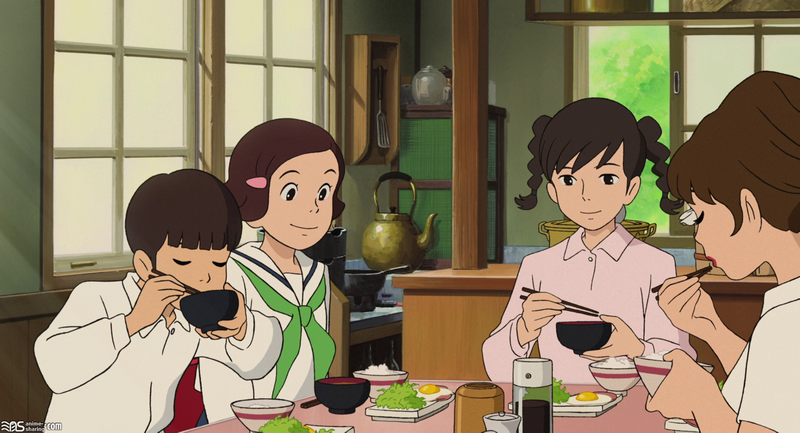 Miyazaki senior has created some fascinating worlds and characters over the last three decades, but I don't think I have ever been privileged to a storyteller who writes such complex and endearing young female characters as he does. Umi is independent, intelligent and multi-skilled, she is well-liked and admired, and when given the opportunity to do something for herself (work on the newspaper, and lead the restoration) she grasps it. When she returns home late from school one night she doesn't find dinner cooked by another member of the house, it is left up to her. What I also admired about Umi was her modesty. Shun is also a passionate idealist who will stop at nothing to save the Quartier Latin, so he's a young man viewers can admire too. An optimistic audience will find plenty of reward in their extraordinary story. This is unlike a lot of films produced by Ghibli Studios in that does not feature a parallel fantastic world, but is set during a period in history. The Korean War, and this period of pre-Olympic preparation are the historical landmarks. Though I have no knowledge of how Yokohama harbour looked during this period, the recreation is convincing. When the characters take a trip to the centre of Tokyo later in the film, the period details explode. As expected, the animation is gorgeous and the attention given to the lushness of rural Yokohama (not to mention to eye-popping blues of the harbour) and the bustling metropolis of Tokyo central amidst the transformation is wonderfully realised. There are some brilliant set pieces and watching the troupe of female students scrub up the more male-friendly clubhouse is especially memorable. To conclude, I will also have to mention the wonderful score/soundtrack. I loved the blend of jazzy percussion score and I felt like the songs - especially those at the conclusion - suited the film perfectly. From Up On Poppy Hill is a very special film and one I find it impossible to believe someone could dislike. It is a film that had me in a state of unwavering joy, with a big grin plastered across my face, marveling at the beautiful details of the animation and finding myself wholeheartedly invested in the story of these lovely characters. It strives to leave its audience feeling happy, and it does it marvelously. I don't have any information regarding a cinema release here in Australia, but if it does come to screens, it is essential viewing. Great review! I also try to make a review sometimes, maybe one day I'll be good as you!.. have a look at my blog if you want! Thanks very much for visiting and for the kind words. Stumbled upon your review. Would definitely look the movie up.